Rose adoptions are partially tax deductible and help support the upkeep of San Jose’s Heritage Rose Garden, the largest collection of rose varieties in the western hemisphere. 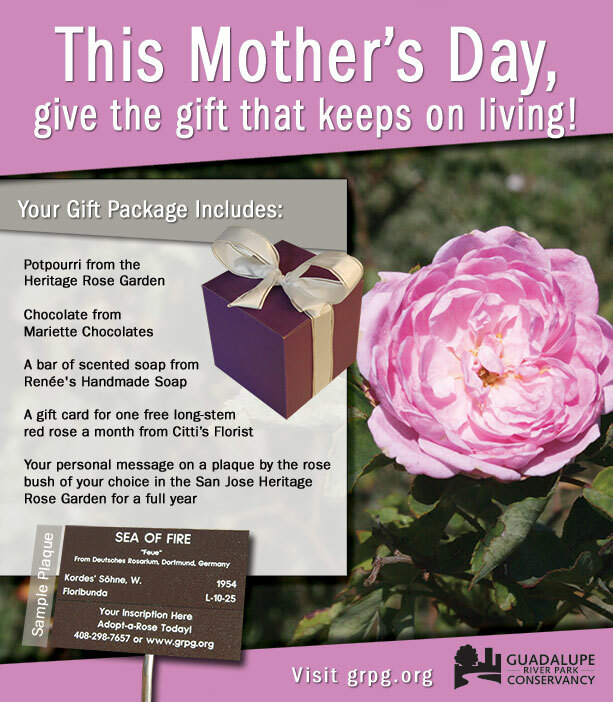 For more information about adopting a rose for your Mom, call 408-298-7657. Come see the garden in bloom! Volunteers will be on hand to help you locate your rose and learn about the garden. Refreshments will be provided. Gift packages will be available for pick-up, prior to Mother’s Day, at the Guadalupe River Park & Gardens Visitor & Education Center or on Sat. May 11 at the Heritage Rose Garden. Special Note: our office is open for adoptions M-F, 9 AM to 5 PM. You can order on-line any time. If you order during the weekend, we will not process the order until Monday. Hope that is okay! for both new and renewed adoptions, and for Mother’s Day, and non-Mother’s Day adoptions. You can place multiple unique adoptions using the “Continue shopping” button on the next shopping cart page. You can also just enter a quantity larger than one to renew a batch of adoptions. Gift Box Notes — We have special gift packages for Mother’s Day and Valentine’s Day, but can help you put one together for any special occasion. Ingredients may vary…we will contact you to discuss this. Ingredients for Mother’s Day are set and mentioned above. We are not able to ship packages, they are only available for pick up. We estimate they will be ready for Mother’s Day around Tuesday, May 7th, but please wait to be notified via e-mail before coming. Inscription — for renewals, you can specify a new inscription, or just type “keep existing.” General limit is 3 lines, 36 characters per line. You do NOT need to use all 3 lines. Order by Wednesday, May 1st and we’ll have your inscription installed in time for Mother’s Day! Rose Preference or Other Comments — (please read the rose selection FAQ below for more info) For renewals, you can specify a new rose, or just type “keep existing.” If selecting from our database, please include your top three choices in case your top choice is not available! What do you mean by adoption exactly? We use the term loosely in this case. Adopting a rose does not mean you have to come down to the Heritage Rose Garden and tend to that plant…though we’d love to have you! Click here to read about our volunteer programs! Basically, adopting a rose just means that you are supporting the garden, and in exchange, you pick a rose for us to put your personal inscription in front of. How do I select a rose? There are many ways to select a rose for adoption. The best way is to visit the garden yourself and look for a suitable rose. However, this does not work so well late Fall through March or so when not much is blooming. If you do this, look for roses that have a plaque in front of them. You’ll notice the plaques have a top part and a bottom part. The bottom area is where your inscription would go. If you see a rose you like but it already has an personal inscription, that means it is already adopted and is not available to you. Other ways of selecting a rose include having us select one for you, or searching our vast database for a certain variety, color, name, key word, or type of rose. For example, if you want to honor someone who is an avid airplane pilot, you could search for roses with names associated with airplanes, flight, sky, pilot, wings, etc. This does not always produce results, but it might be fun to try. In some cases, it might produce too many results! You can also search for certain colors, years of hybridization, etc. When will my inscription be installed? For orders placed by Wednesday, May 1st, we will have your inscription installed in time for Mother’s Day. That way, Mother’s Day might include a trip to the garden to see “her” rose! In general, installation takes 4 weeks since we have a small staff. How do I find my rose once I am in the garden? First, review this map to get a general understanding of how the garden is laid out. Before visiting the garden, make sure you know the location of your rose (something like M-15-8). This was given to you when you originally adopted the rose and again during all subsequent renewals of the adoption. Let us know if you need a reminder…we can look it up. Once there, you’ll notice the garden is divided into six sections: K, L, M, N, O, P. Rose locations are indicated using the following convention: M(section) – 15(row) – 8(position). First find your section. Then walk down the path checking the rows until you notice your row. Once in your row, walk down the aisle until you locate your rose’s position. What happens after my one year adoption expires? In the month before your adoption expires, we will review your plant and plaque to make sure they are both looking good. We’ll then send you a renewal notice. You can renew the adoption for $50/rose for another year ($60/rose with a gift package), or even multiple years at a time. Can I change my inscription or rose? You can do this any time during your adoption, just let us know! What happens if I do not renew my adoption? If you choose not to renew, we will remove your personal inscription and make your rose available for adoption by someone else. We do archive all adoptions, so if you wanted to revive the same adoption at a later date, we could pull up the inscription and rose choice…though that same rose may no longer be available. If I do not renew, can I have the personal inscription portion of the plaque? Sure, we pull off your inscription and put up a blank, so it is easy for us to mail you the personalized bottom portion. In general it is pretty sticky from the tape and sometimes pretty weathered, but some people like to keep it as a keepsake. What if my rose dies or my plaque needs repair? No problem, we can select a new rose or make a new plaque any time. Since we have a small staff, we can only check on your rose specifically once a year before renewal time, but if we catch wind of a dead rose or broken plaque, we’ll contact you to select a new rose. Or if it’s the plaque, we’ll just repair it right up. If you happen to visit and notice a problem with your rose or plaque, just let us know. We do our best to keep the roses healthy, but invariably, some die. For regular adoptions, the money is 100% tax deductible, and you will be sent the proper documentation to back that up. If you adopt a rose as part of our special Valentine’s Day or Mother’s Day promotions, then the full amount is not deductible because you receive some goods in exchange. What are these special promotions at Valentine’s Day or Mother’s Day? It’s the same adoption program, except that during these promotions we offer special gift boxes full of various items, such as candy, soap, cards, potpourri, and more. During those times, you’ll find more details on this very web page. Your donation for these special promotions is only partially tax deductible…the total donation amount minus the value of the gift package, which is usually about $12.